Situation: Cam is cooking a meal for himself and his friends. Resolution: Since Cam is reasonably intelligent and/or has at least one level of the cooking skill, the GM doesn’t make Cam roll anything and instead says that he succeeds at making a tasty meal. Situation: Cam is cooking a meal for a dinner party. One of the attendees is a girl that he wants to impress. Resolution: The GM makes Cam make an AWR +skill +1d20 roll to see how good the meal is (the higher the result the more she is impressed). Situation: Cam is trying to get a meal at a trendy restaurant and has been given a chance to cook something for the head chef. Resolution: The GM makes Cam make an AWR +skill +1d20 roll, allowing Cam to choose the difficulty he is trying to meet, and also allowing him to add in a +6 for having his own special tools and tackle-box full of rare spices. Situation: A serial killer has kidnapped Cam’s parents and hidden them somewhere in the city, threatening to kill them unless Cam cooks the best meal that the serial killer has ever had. Resolution: The GM sets a Legendary difficulty, and allows Cam to start assembling various plusses: from dosing himself up on smart drugs and Bright, from using his special tools and spices, from strong-arming his way into the city’s fanciest restaurant and taking over their high-tech kitchen, from calling on his old cooking mentor for advice. Other actions (often involving their own skill rolls) made by Cam’s friends can also give plusses: his Runner friend is racing around the city at top speed gathering the freshest ingredients, his Needle Punk friend assembles a cocktail of tasteless drugs to put in the meal designed to increase the serial killer’s appreciation of it, his Thief friend has broken into the serial killer’s home to see what he has in the fridge to get a sense of his tastes, and his Math Addict friend does internet research on studies of the effects of environment on appreciation of food and is redecorating the dining room in a way calculated to maximize the ambiance. The end roll is the result of an entire game session worth of activity. ORC is a Role Playing Game rules system. ORC character creation is fairly crunchy, but its crunchy for a reason. The rules are primarily meant to model physics and biology. ORC gameplay is easy to learn and quick to use. All rules work from the same basic mechanic. The rules can scale from light to crunchy based on the needs of the story. The most complicated part is combat, because the combat system allows for people to use real-life strategies and to employ every resource available to help them win. ORC is not a generic system designed to be able to be instantly dropped into any setting. ORC is designed for realistic, low-powered gameplay (as opposed to legendary, superheroic, comedic, etc. games). ORC character creation must be specifically tailored to each game setting. ORC does character classes in a realistic and flexible way. They say what the character’s pace in society is, not what the character can become. The full ORC ruleset plus a complete set of mundane modern day skills, jobs, equipment, advantages and disads. 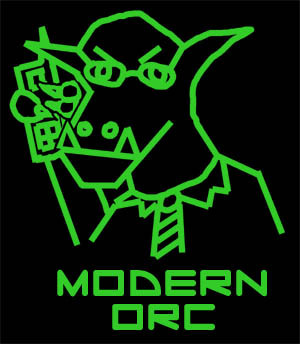 Modern ORC is licensed under a Creative Commons Attribution 3.0 United States License. The plain character creation and play rules stripped of any setting-specific stuff. Vanila ORC is licensed under a Creative Commons Attribution 3.0 United States License. Do ORC combat in card-game format with cards for common FWTD street skills and weapons. Some people dislike character classes because they say they are too restrictive. I don’t think character classes, if they are done right, need to be “restrictive.” I know that character classes have been done poorly in the past, but that’s no reason to discriminate against something with great potential. First off, non-character class systems often come with the advertisement that you can be anything you want, and this is seldom true. In any game, your character is part of the game universe. If you could just decide that you belong to a race of cat people, that changes the game universe (it means there’s a race of cat people in this game universe). If the GM has not yet made up the game universe, that might be fine. In most cases, though, the GM has requirements for what he or she needs characters to be, yet they are often afraid to tell you what those requirement are for fear of seeming “restrictive”. When done well, character classes are the fastest way to let players know what the game world is about. There will always be people coming in to the game who don’t know what the game universe is about. It is not fair to ask these people to create a character with no guidelines, because the player can’t know what his or her relationship with the game universe will be. If you have character classes, then starting players know what their basic options are. They can choose the general segment of society they want to belong to, and they can read a short description of how that segment of society lives and how it interacts with other segments of society. If it’s a good character class system, it will give each class advantages but not restrict anyone to anything (for instance, in Organic Rule Components, different types of skills are cheaper for some classes than others, but everyone can buy every skill type). If it’s a bad character class, it will tell characters what weapon they have to use and what skills they can have (but nobody still plays game systems that archaic, right?). Finally, character classes are realistic. This is the point I feel most strongly about. In any society, people are restricted to roles. Those roles don’t necessarily correspond to what the person wants to be, or what they think of themselves as, but they do effect how the person lives his or her life. In some cases occupation might be a better term than character class, but this is not always so. Your role in society effects what duties you have every day, what access you have to money, special equipment, skills. Roles can change, but at any given time you have to fit at least one societal role (even if that societal role is ‘hermit’ or ‘outcast’ or ‘wandering madman’). I think that this realism enhances game play because it prompts players to think interesting questions about their characters, like: Does you character like his or her class? Are they good at what they do, or bad at it? Does your character have plans of excelling in his or her field or of becoming something else? Is the character this class by choice or was he or she forced in to it? Yes, character classes are restrictive, but life is restrictive, society is restrictive, and any good game is restrictive. Character classes just lay the restrictions out on the table and let people get on with choosing their options in a somewhat realistic manner. ORC is the Creative Commons licensed role playing game rules of Fates Worse Than Death, Tibet, In Dark Alleys and other great games. Geeks: Good at tech, science, intellectual stuff. Bad at athletic, charm, agility based stuff. Jocks: Good at athletics skills (including wrestling). Bad at tech, science, intellectual stuff. Stoner/Skaters: Good at vehicle and stunt based skills, creative skills. Bad at tech/science/math. Step Two: Divide skills in to general categories, based on what you want classes to be good and bad at. For instance, in the highschool game there might be Athletic, Creative, Social, Stunt, Intellectual. Then figure out what the average highschool student would pay for each type of skill. For instance, people might pay 6 skill points for Social, Athletic, Intellectual, 9 for Stunt and 5 for Creative. The cost should be based on how rare you want those skills to be and how useful the skills are. Step Three: Figure skill costs for each class. Try to make sure they are fairly balanced: people who pay more for something should pay less for something else. They don’t have to be completely balanced if characters are getting bonus advantages or disadvantages. Step Four: Are there any advantages or disadvantages that any member of the class has? If so, list these as mandatory advantages and disadvantages. For instance, Jocks might get the free advantage “Athletic Build (+2 STH, +1 SPD, +1 BDY)”. Stoner/Skaters might get the mandatory disadvantage “Hated By Authority.” Also, are there any advantages and disads that one character class has access to? For instance, maybe only Geeks can buy the advantage “Taking College Classes” for 3 Bonus Points. Step Five: Are there any special skills that only one class has access to? For instance, maybe Stoner/Skaters have access to “Drug Resistance,” which only they can buy, and maybe it costs 5 points per level.